Enjoy this upcoming Christmas. Something great for all of you. Head down to your nearest CITIGEMS store and indulge in your FREE diamond pendant promotion. Terms and Conditions apply. 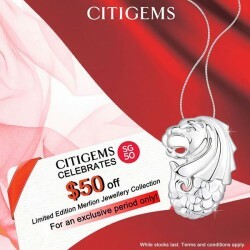 Join us to Celebrate SG50 at CitiGems , $50 off limited edition merlion jewellery collection for an exclusive period only! While stock last. Term and conditions apply. 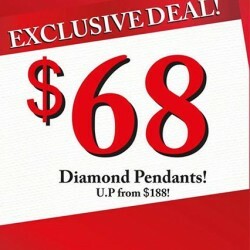 For a limited period only, you can get to own a dazzling diamond pendant at just $68 (Usual price from : $188)! A totally exclusive and awesome deal with no strings attached. Over the next couple of days, we will be sharing some of the diamond beauties which you can get at $68 so don't stray too far from here! While stocks last! 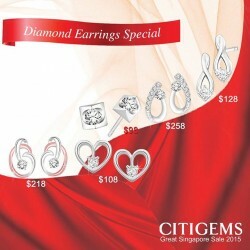 Enjoy The Great Singapore Sale diamond earring special @ CITIGEMS, hurry! Till 14 May 2015 Enjoy additional 10% off storewide @ Citigems. CITIGEMS Mother's Day Exclusive Promotion! 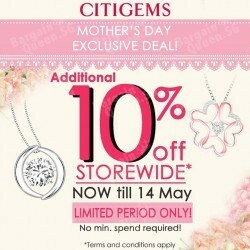 From now till 14 May, they are having an additional 10% off storewide promotion at all CITIGEMS boutiques! This is the perfect time to get Mummy dearest the sparkle she deserves. No min spend required. Limited period only. Terms and conditions apply. Visit their website for showroom locations. 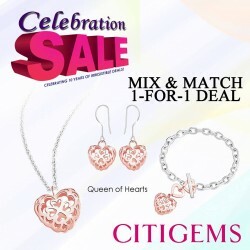 Enjoy additional 10% off storewide* promotion @ all CITIGEMS boutiques. Limited period only. 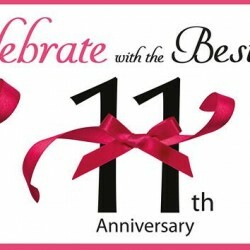 CITIGEMS 11th Anniversary SPECIAL DEAL! Don't say they didn't tell you! 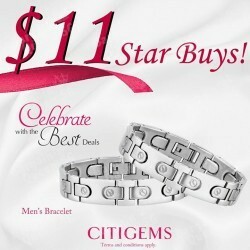 Another exciting star buy from their $11 Star Buy promotion is the masculine Men's Bracelet, available at $11 each! WHILE STOCKS LAST! Terms and conditions apply. The Citigems 11th Anniversary Promotion is on. Check out their Special Deal for $11 only. For a limited time only. While stocks last. Terms and conditions apply. Visit in-store for more details. 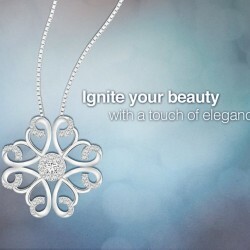 Ignite your beauty with a touch of elegance. Bring out your style with CITIGEMS' new Spring Jewellery Collection. Enjoy an additional 10% off and live The Good Life® with your Standard Chartered Card. 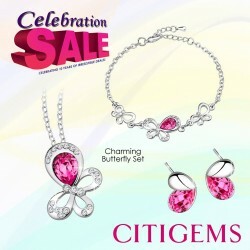 Grab these Charming Butterfly sets at all CITIGEMS Boutiques at only $58/Set. Available in both blue and pink. Valid till While Stocks Last. Check out our CITIGEMS boutiques for more details. Grab these 1-for-1 special deals at $28 each. Celebrate 10 years of irresistable deals now! If you want to get 2 of the same necklaces, bracelets or earrings for both you and your BFF, this is the time. Mix and match in any ways you want, and choose any 2 individual pieces from either Queen of Hearts or Glamour Star for just $28! Valid till while stocks last. Check out our CITIGEMS boutiques for more details. 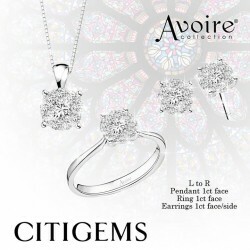 The brilliant sparkles of the AVOIRE® diamond range is a stunning collection, crafted in a splendid assortment of settings to reflect the multi-faceted beauty of women. Get this 4 carat face set at only $1388/set. Now available at all CITIGEMS boutiques. 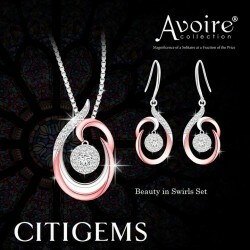 CITIGEMS promises you both happiness & beauty with Beauty in Swirls Set. Available at all CITIGEMS boutiques, at $688 per set.